Your dog will beg you for more! 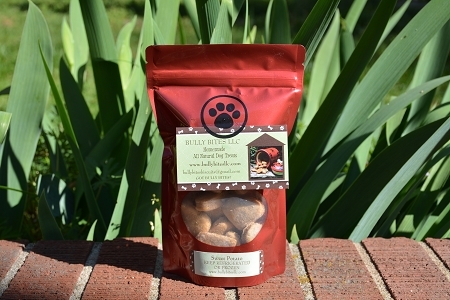 These treats have a natural sweet flavor that your dog just won't be able to resist. Ingredients include...White/Wheat flour, Cinnamon, Sweet Potatoes & Raw Honey. All Bully Bites treats are Egg and Dairy Free. All natural with no preservatives added, & made from only the best human grade ingredients. Bully Bites are soft, not hard. Great for the very small dogs, older dogs and dogs in training, as you can easily break them into smaller pieces for training treats.